Cement-Bentonite (CB) slurry walls represent a smaller and more specialized portion of the slurry walls installed in the US. Alternatively, in Europe and other international locales, CB slurry walls are the more common barrier wall choice. 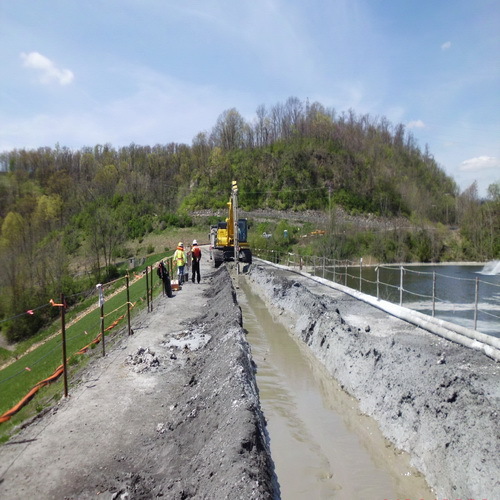 In this method, the wall is excavated through a slurry that typically consists of water, bentonite, cement, and occasionally other additives such as blast furnace slag or attapulgite. The trench slurry hardens in place, normally overnight. The hardened CB slurry serves as the final barrier wall. 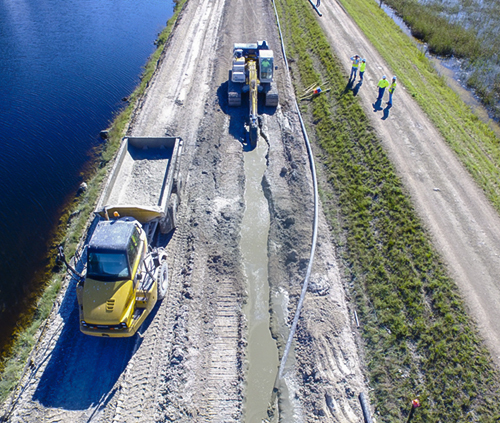 Cement-bentonite installations do not require a separate backfilling operation and it’s for this reason that this technique is sometimes referred to as one-step slurry wall construction. The first use of a CB slurry wall in the US dates back to the early 1970s. 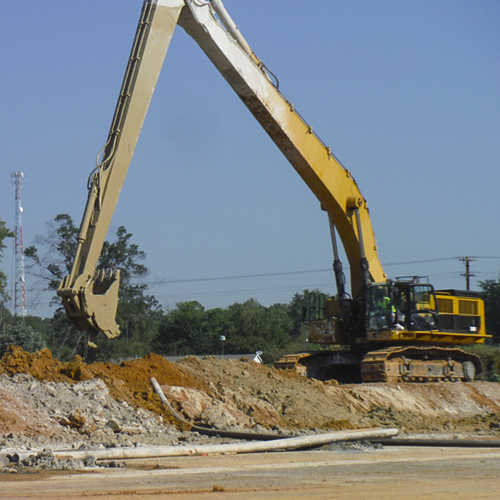 Useful on smaller project with limited access or narrow work zones because of the smaller equipment footprint. 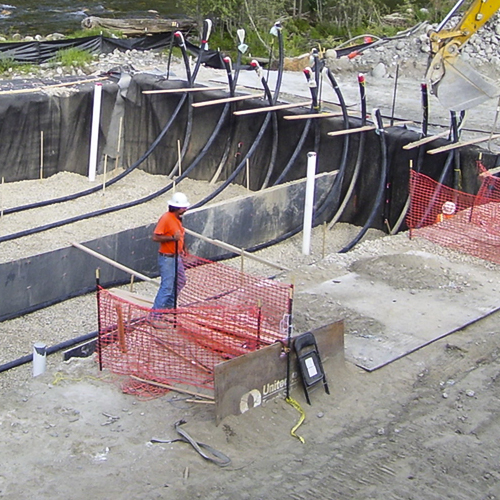 No excavated soils are used in the final barrier wall, which is beneficial in areas with undesirable backfill soils. 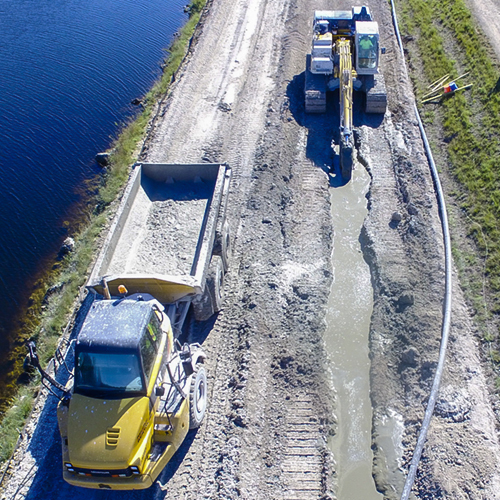 Since CB slurry is heavier than bentonite slurry and self-hardens, this method can provide improved trench stability and more easily overcome weaker ground conditions. Since the slurry sets after ~1 day, overlapping segments can be constructed in any direction or order to form a continuous barrier. 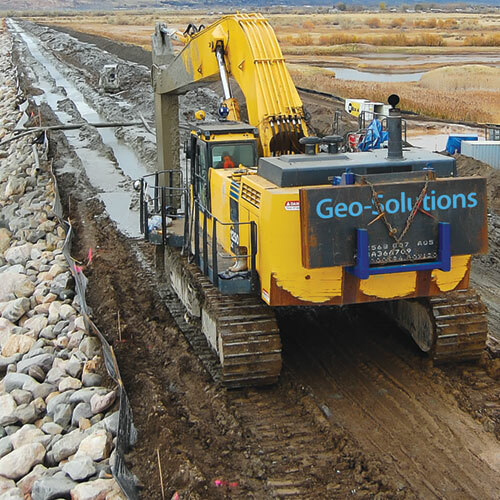 Segments can be used to traverse up or down moderate slopes (5-15%) with minimal earthwork construction. Construction of walls through porous ground conditions is possible. Can be used to remove unsuitable materials below the groundwater without shoring or dewatering. CB backfill, once set, has a higher strength than SB backfill. CB walls may be excavated using hydraulic excavators and/or clamshell excavation equipment, the same equipment used for other slurry walls. 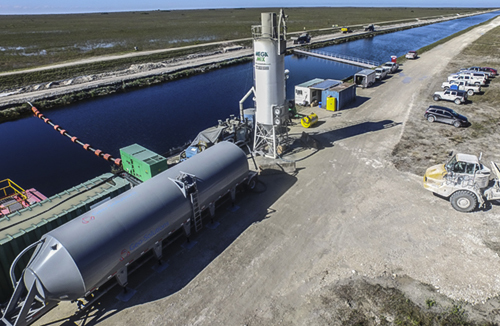 At the slurry plant, cement, or some other setting agent, is added to the bentonite slurry. 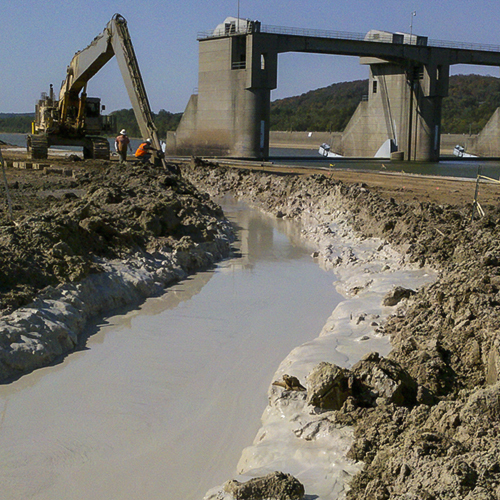 The viscosity of the mixed slurry is designed to be in the fluid range during the excavation process. 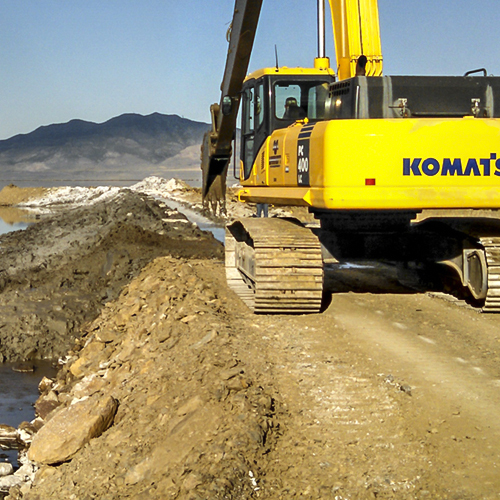 The slurry is then pumped from the mix plant to the excavation. 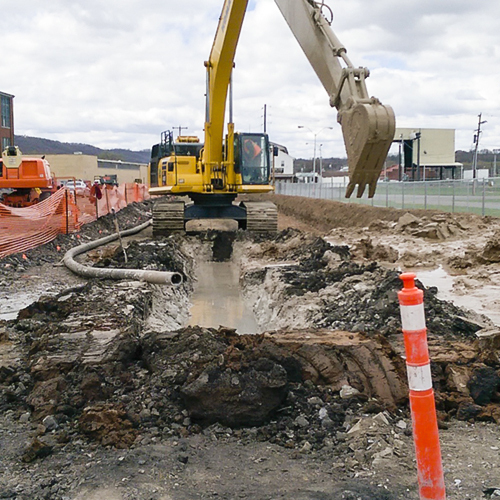 Once the excavation is to full depth, the bottom is cleaned and the process moves on. The slurry stays in the trench and is allowed to set. Typical CB slurry will attain a butter-like consistency overnight and a clay-like consistency after fully hardening. CB material generally attains 75% of its utlimate strength after 28 – 56 days or curing and close to 100% after 90 days of curing. The properties of interest for most CB slurry walls are strength and permeability. CB slurry has a relatively high water content and because of this there are more water-filled voids than in a Soil Bentonite backfill. This higher void ration results in typical permeability values that are higher than SB backfill, generally in the 10-6 cm/sec range. Permeability values measured on a recent CB project for a standard Portland cement CB mix are shown in the plot below. CB can take months to fully harden and long term tests have shown CB permeability gradually decreases (improves) with time. Chemical compatibility is also an important parameter when designing containment systems for impacted GW. CB has a pore size that is particularly well-suited to resisting certain oils and petroleum products and thus it is often preferred on site with heavily contaminated GW. CB backfills can also be created using special cements and other additives. Additional additives and special cements are generally used to realize lower permeability and improved strength. Depending on location and material availability, these materials can be more costly, but permeability values in the range of 10-8 cm/sec and strengths in excess of 80 psi (0.5 MPa) are possible after 90 days of curing. A design mix program is always recommended to optimize CB performance.